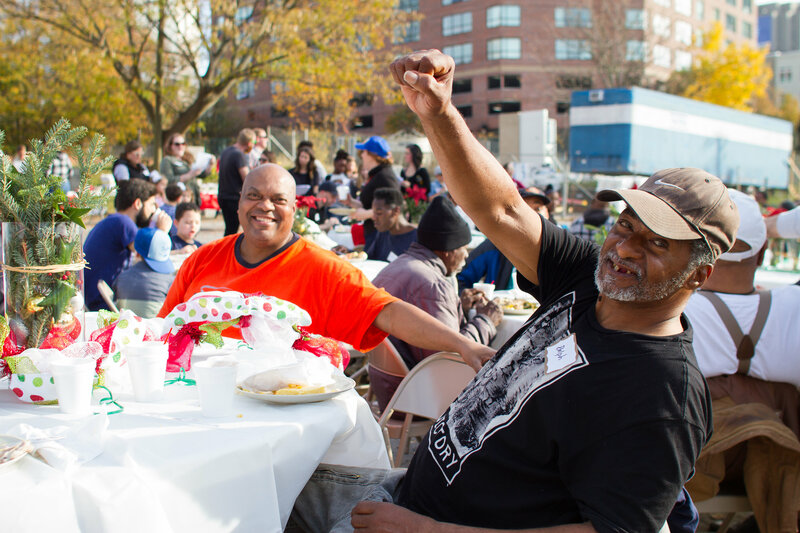 For nearly two decades, Lazarus has held an annual Christmas Dinner in the heart of Atlanta. This year, we will gather together at Atlanta First UMC at the corner of Ivan Allen Jr Blvd and West Peachtree Street. This event is a celebration of the Advent season and the culmination of another year spent sharing life together with men and women experiencing homelessness in our city. We do this sitting side-by-side and feasting together. We intentionally hold the dinner outside for the comfort of the chronically homeless that may feel uncomfortable coming indoors. Sign ups are closed, but you can still come! If you have friends and family who would like to join, but have not signed up, then please bring them along. All are welcome. Everyone signs in at the registration table, and everyone can enjoy the fellowship, dinner, and caroling. Below you’ll find meeting times and locations for your section as well as general info to keep in mind on Sunday. Location: Parking lot behind Atlanta First UMC(360 Peachtree Street, NE Atlanta, GA 30308) located at the corner of W Peachtree St and Ivan Allen Jr Blvd. Parking: We encourage you to carpool or take Marta. There are several paid lots and some on-street parking in the area. The Civic Center Marta Stationis a short walk away. Weather: All of our events go on whether rain or shine! Right now, the forecast is calling for a warm, partly cloudy day, with a chance of rain early. So make sure to dress appropriately. Be sure to wear comfortable shoes! Safety: Please be safe, walk in groups, and if you have any issues ask any of the security team to help you. Please do not give any rides, give out any of your personal information (address, cell phone number, etc.) and stay within the area of the dinner. Have Fun: Remember that this event is about building community and making friends. The lines between guest and volunteer are blurred on purpose. So, have fun, eat a good meal, and meet some people!